2 Beds 2 Baths 1,100 Sq. ft. MAGNIFICENT AND BREATHTAKING! 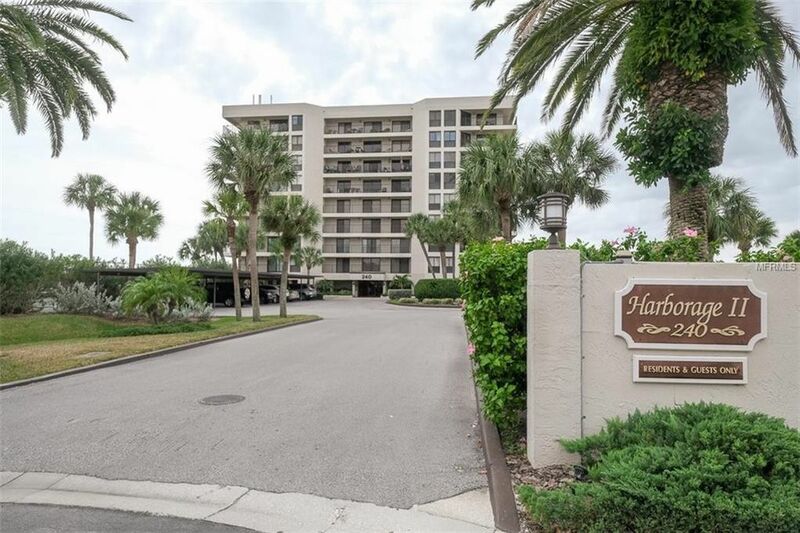 THIS IMPECCABLE 1ST FLOOR CONDO WITH DEEDED BOAT SLIP (#33) IS LOCATED IN THE HARBORAGE II COMMUNITY ON SOUTH SAND KEY. THE HARBORAGE II BUILDING IS NESTLED ON A QUIET RESIDENTIAL PENINSULA AT THE END OF A PRIVATE ROAD. THIS LOVELY, GATED COMMUNITY HAS A SECURITY GUARD AND CARD ACCESS ENTRY, TOO. THIS ADORABLE CONDO FEATURES 2 LARGE BEDROOMS AND 2 FULL BATHROOMS. THE CONDO HAS AN ENORMOUS COVERED BALCONY THAT OVERLOOKS THE GORGEOUS INTRACOASTAL AND PEACEFUL CANAL. THE CONDO FEATURES AN OPEN CONCEPT DESIGN AND HAS A SPLIT FLOORPLAN FOR PRIVACY. THE SUPRISINGLY LARGE KITCHEN HAS WOOD CABINETRY AND FEATURES A BUILT-IN WINE RACK, ROLLTOP BREAD BOX, LAZY SUSAN AND A GREAT DEAL OF STORAGE SPACE. THE SIZABLE MASTER SUITE INCLUDES A WALK-IN CLOSET, SEPARATE VANITY AREA WITH DUAL SINKS, UPDATED WALK-IN SHOWER AND A SLIDING GLASS DOOR THAT LEADS TO THE BALCONY. THE 2ND BEDROOM HAS A WALK-IN CLOSET AND SLIDING GLASS DOORS. THE 2ND BATHROOM FEATURES SHOWER/TUB COMBO. CONDO HAS AN INTERIOR LAUNDRY ROOM WITH A STACKABLE WASHER/DRYER AND A CONVENIENT UTILITY SINK. OTHER FEATURES INCLUDE CERAMIC TILE THROUGHOUT, LINEN CLOSETS, VERTICAL BLINDS & MUCH MORE. NEWER A/C IN 2015. THERE IS AN ASSIGNED CARPORT (#17) AND A SECURED OUTDOOR STORAGE UNIT (#17). THE AMENITIES OF THE COMMUNITY INCLUDE A HUGE FISHING PIER, HEATED POOL, GAS GRILLS AND PICNIC AREA, TENNIS COURT AND AMPLE GUEST PARKING. THIS TERRIFIC COMMUNITY IS LOCATED VERY CLOSE TO MULTIPLE BEACH PARKS, RESTAURANTS AND SHOPPING. Directions: FROM GULF BLVD GO EAST ON SAND KEY ESTATES DR. GO TO THE SECURITY GUARD STATION FOR A DASHBOARD PASS AND ASK FOR DIRECTIONS TO THE HARBORAGE II BUILDING.